We had a really busy week last week. We got back from Santorini in the early hours of Wednesday after have a great much needed holiday and blast of summer weather. We had the Westmorland Show on Thursday. this is very local to us so we put on a nice display and enjoyed the sunshine. At the weekend Simone was demonstrating at Castle Howard in Yorkshire and Steve was at Marston Vale near Woburn Abbey. The weather on Saturday was perfect, sunny all day. Sunday stayed fine but was overcast. 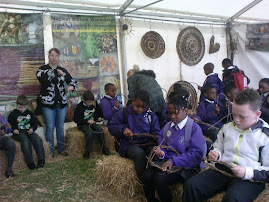 Steve wove pigs and baskets and Simone ran fish weaving workshops.